Twisted Twigs On Gnarled Branches Genealogy has been changing the way researchers receive documents held by the National Archives. It is a NARA Record Retrieval Service. They perform access to records held at Archive 1 (Washington D.C.), Archive 2 (College Park, Maryland), the National Archives in St. Louis, Missouri, and the National Personnel Records Center (NPRC). Since NARA and the NPRC have been working to restore many of the Army or Air Force service record veteran’s military records that were “lost” in the 1973 Fire, Twisted Twigs can help you find out if your ancestor’s record is among them. We recently had a chance to ask the Owner of Twisted Twigs Genealogy National Archives Record Retrieval Services, Deidre Erin Denton, about how NARA records can help your genealogical research and why a data retrieval service may be a good choice to access these records. Why should genealogists consider using the National Archives? The National Archives is perceived to be mainly a source of broad historical government information rather than containing the more personal kind of information usually sought by genealogists. However, the history of our country is made up of the history of our people – the records held at NARA were created by and for those people, and can hold an incredible amount of personal information that’s often overlooked. It also holds records that can flesh out the story of our ancestors in addition to the dry facts of dates and places that are the bedrock of family history research. To truly understand the stories of our ancestors, we also need to look at the broader world in which they lived. NARA holds a fantastic amount of information that can help to do that. When does it make sense for a genealogist to hire a data retrieval service at NARA locations? The most satisfying ideal would be for everyone to have the ability to do their own hands-on work in the Archives. However, that’s not always possible; when someone has a limited budget for research and records just the costs of a trip to the Archive can cut into that budget drastically. Each Archive facility has different holdings, so factoring in multiple destinations to obtain complete sets of records puts it out of reach for many people. Additionally, navigating the vast collections at the Archive can be overwhelming for someone unfamiliar with them. This is where professional help can be invaluable. The type of professional help available for NARA records is usually either a traditional research firm or a record retrieval firm. The two services are often conflated, but in reality, each primarily performs a very different type of service with just a bit of overlap. A research firm is typically more expensive and can be a good fit for someone who needs extensive research help. Research firms usually include additional services as well, such as organizing all the information into a polished narrative package for you. By contrast, retrieval services focus on copying specific records based on information you provide; expect to pay considerably less for this service, but don’t expect them to perform extensive in-depth research for you. Hiring a professional should be considered when you need a way to get records that will push your own research further along and allow you to obtain documents that aren’t otherwise easily available to you. Hire a retrieval service when you generally know what kind of information you want, you have solid research information to begin the search, and you want to get the maximum record value for the money you spend. A professional retriever can cut straight to the most valuable records and usually obtain them faster and with greater accuracy. Great ones can also suggest other records of interest based on their experience in the Archives and help you sort out incorrect information as well. How do you recommend that someone chooses a data retrieval service? Find an established company that specializes in the type of records you seek and works regularly in the repository where the records are held; they’ll have the best success rate at locating records because they already know the ‘tips and tricks’ of the collections. Solicit recommendations from a variety of people, including other professionals. Remember that no company will satisfy every client because in genealogy research each client has different needs and different expectations. Don’t stop at happy or unhappy – ask for details on why a person thinks a company is good or bad. If they are unhappy solely because a company provided records that proved a treasured family legend was false, that’s a company you still want to consider hiring. Finally, look for a company which will provide everything you need without excess fees for services that don’t benefit or interest you. What is the most exciting find you have made at the National Archives? So many it’s difficult to pick one. It’s really a privilege to handle all these original records. A favorite truly exciting find is an original Walt Disney cel drawing tucked into a unit history folder and forgotten for decades. It was created as a ‘mascot’ for the 56th Signal Battalion. As soon as I pulled it out, the archivists allowed me to photograph it then whisked it away to be placed in the preservation vault due to its value. It was not something I ever expected to see in a military unit history file. You have great genealogy memes on Facebook. Where do you get your ideas? They come straight from real life experience. I inherited a both a love of family history research and a wicked sense of humor from my family. I’ve been doing research since I was very young, so I’ve seen all the bizarre kinds of things that can happen when you look for ancestors. Sooner or later every genealogist will run across similar situations; sometimes all you can do is either laugh or cry, and I’d rather laugh. It’s great to have such a lot of people in the Twisted Twigs community who both understand the problems and appreciate the jokes. I love sharing my passion for genealogy with them! 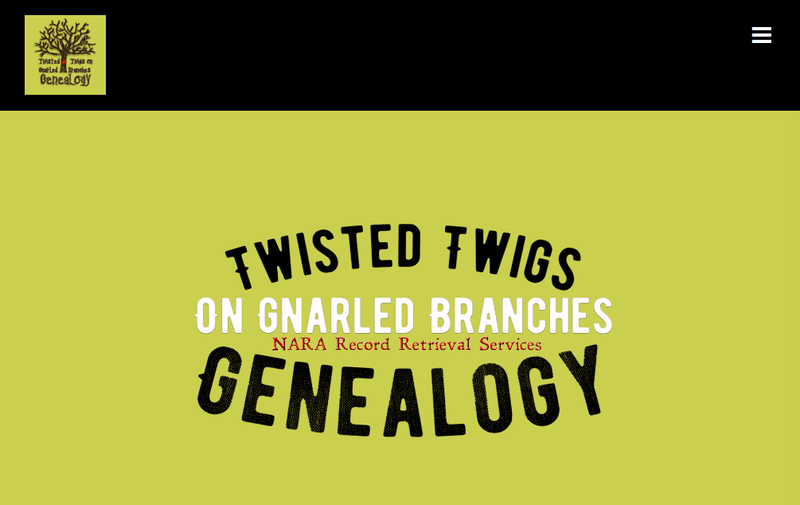 You can find out more about the records and service offered by Twigs On Gnarled Branches Genealogy on their website Twisted Twigs On Gnarled Branches Genealogy. While there, you can read “Testimonials & Kudos” from satisfied customers at https://twistedtwigsgenealogy.com/kudos. You can also check out the blog on the website, including “Happy New Years! Time to Tally Up Your Family Tree for 2019“. 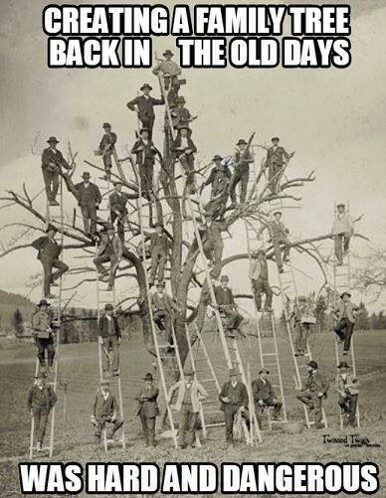 Twisted Twigs posts, memes and advertisements of current specials can be found on their Facebook page: Twisted Twigs On Gnarled Branches Genealogy. Twisted Twigs is currently having a Shutdown Sale with special offers on Pre-1917 Pensions and 20th century OMPF files. It will end the day the archive reopens. The Twisted Twigs Swag Shop has all kinds of wearable funny genealogical goodies is always open. 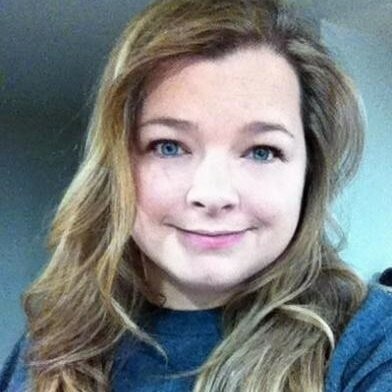 Deidre Erin Denton is a well-seasoned genealogist who has worked with clients since 2005, and who specializes in National Archives record retrieval in Washington DC, College Park, MD, and in St. Louis, MO. She believes at all researchers should have affordable access to NARA records. Twisted Twigs started offering NARA record retrieval services in the summer of 2015 and record retrieval services at The National Personnel Records Center in Saint Louis (WWI/WWII/Korean War military records/ Personnel Files) in June 2016. As of July 2018, Twisted Twigs has retrieved over 2300 military pensions and 3500+ service records in 42 months.